The build up of sludge in hot water central heating systems is inevitable, no matter what fuel source is used.Over a period of time this sludge can block pipes and prevent the radiators from distributing heat around your house. Powerflushing clears any limescale, dirt, corrosion and rusting from your radiators, boiler and whole central heating system. Increase your central heating system life by a regular radiator and boiler descaling. Our powerflush plumbers operate in London. 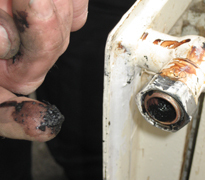 Why do you need Power Flushing? What is power flushing you may be asking? Are you having central heating problems? Is the system slow to warm up? Are some radiators completely or partially cold? Do radiators need frequent bleeding? Do you have repeated pump failures? Fushes your central heating system helps get rid of the sludge and scale deposits that clog up your central heating systems and cause problems.